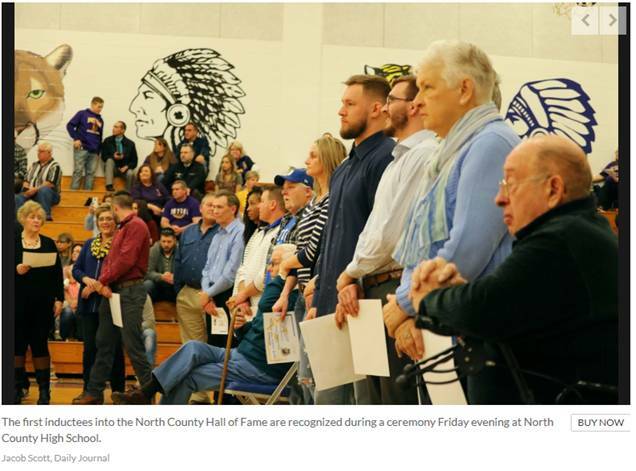 After a junior varsity game between North County and Potosi and before the night’s homecoming coronation, North County administrators, faculty, players, parents and friends paid respect to distinguished alumni and past faculty in the first-ever induction ceremony into the North County Hall of Fame. Athletic Director Chad Mills presented each inductee with a certificate while the individual’s accomplishments were read aloud. Among the inductees were longtime coaches, professional football players, fallen heroes, community leaders, businessmen and many more. Not every inductee could attend. Forty-five total individuals were inducted into the hall of fame, being selected by a committee from the communities of both Bonne Terre and Desloge. Photos of the inductees now hang in the North County High School Auditorium. After the initial class, school officials plan on inducting four new individuals each year, two from the athletic department and two from the district at large. Nominations are accepted year-round for the hall of fame, with the cutoff for the year being Aug. 1. Nominations forms can be found on the district website under the athletic department and can be submitted to Chad Mills at cmills@ncsd.k12.mo.us or by mail at 7151 Raider Road, Bonne Terre, MO 63628. This year’s North County Hall of Fame Inductees include the 1997 State Champion Baseball Team, the 1997 State Champion Track Team, the 2003 State Champion Baseball Team, Dave Blunt, Bonnie Bradley, C.E. Brightwell, Dr. Craig Brown, Cody Compton, Will Compton, Michael Deason, Taylor Decker, Lisa (McKay) Eaton, Jim Edgar, Shawn Edgar, Rose (Edwards) Fulton, Dave Gibson, Derek Gibson, Matt Haug, Bill Hill, Adam Howard, Randy Hubbard, Harold Huff, Barbara (Allen) Jones, P.J. Jones, Bill Martin, Jeromy McDowell, Brandon McIntyre, Aaron Moser, Dr. Ken Owen, Steve Pasternak, Ed Ragsdale, Greg Ragsdale, Bob Rickus, Dr. Jennifer (Williams) Riney, Dan Schunks, Dan Smith, Jack Stegall, Josh Sutton, Bobby “Pete” Tiefanaur, Josten Wampler, Ron Whittier, Jeff Wilfong, Stacy (Tiefanaur) Wilfong, Jason Winckel and Howard Wood.